Forty-three years had passed since he had begun sitting outside this Gopalji Mandir with the heirloom Singer sewing machine. The locality recently renamed as Usman Nagar was still commonly addressed by its old name of Purana Gopal Gunj. The thriving marketplace in this area was forever over-crowded, humming and bustling with activity. Beni Madho had tried his hand at virtually everything till he was 25 years of age, with little or no success in each of his ventures. That was when his father put his foot down and insisted he take up the family occupation of tailoring. If nothing it would at least bring home a regular income, instead of the constant losses they had had to endure with his hare-brained schemes. He had given in half-heartedly, having nothing positive to argue in favour of his actions yet somewhere along hoping for a windfall that would let him chase his dreams of travelling the world, meeting new people, maybe become a tour guide like his best friend Birju. 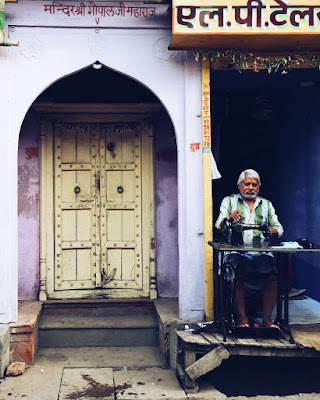 Nothing of that sort had happened and he was still sitting here frozen in time under the board of L.P Tailors (Laxmi Prasad - his great-grandfather's shop), doing the same thing mechanically for the last forty years. Day in day out, he stitched, sewed, patched, zipped, hemmed, tacked away with little or no interest in his work. Wait….didn’t we say forty-three years? Well, in the last three years his life had drastically changed! He continued to occupy the same spot in the busy market-place but with a difference. His unique, vantage position and nondescript looks made him the perfect candidate to observe and report the recent nefarious activities occurring in that area. He had become an invaluable asset to the local police, as their covert police informer! Three years ago a scuffle and fight between two rough-looking characters in the market had made him look up from his sewing. He saw the two clearly and at once made up his mind that these were two no-gooders! After a while, two plain-clothes men whom he knew to be inspectors in mufti, came around desperately searching. They were questioning people about something. Eventually they came upto him. “Chacha, did you see two strangers here in the market?” Beni could never recollect what exactly triggered him to affirm having seen them when no one else in the whole street owned up to having seen anyone out of the ordinary. The policemen were thrilled and very courteously requested him to accompany them to the station. This had rattled him considerably, especially as he could see the sympathetic glances thrown his way from the adjoining shops. At the station he gave a very definite and vivid description of the two roguish characters he had seen. The policemen had tipped him a hundred rupees and told him to keep an eye open and report back to them if he ever caught sight of the two. Beni saw the two strangers again a few days later, this time with beards and caps, but still he had no doubt they were the same duo. He walked as fast as his old legs could carry him to the nearest phone booth, took out the carefully saved number of the inspector and hurriedly conveyed his sightings with details of their current location. In no time at all, there came half a dozen cops, again in mufti, who effortlessly cornered and caught the two thugs unawares! The inspector called him again to the station and this time thanked him profusely for his timely help and asked him if he would be willing to take up the job of an informal informer, at a weekly retainer of Rs 500 plus Rs 2000 as a reward for every valid piece of information. From having a totally lack-luster and insipid job, Beni’s fortunes had turned for the better with this episode. And thus it was that, Beni sat pedalling casually at his machine more interested in observing the movements and crowd around him than the piece of work he was supposed to be working on. This was his true calling he mused with a smug smile, reminiscing the number of cases he had helped crack with his keen observation and tip-offs from his humble perch. Gopalji had indeed been kind to his dwarpal! "Baba, Baba....come on, time to go home. How was your day?" asked Chutki his daughter. This was her routine each day as she took him home, holding his hand lest he wandered away, which he did ever so often. He kept mumbling about keeping watch while clutching on to the old tatters he had been sewing over repeatedly. Three years ago in a stampede in the market place, he had fallen down and lost consciousness as he hit his head on a stone. He had woken with a,"Who am I, where am I....". Ever since, he had been having episodes of delusion and hallucination. He lived in a make believe world, a new one everyday. Today he was living out his favorite character of the 'police-informer'. The above post is a work of fiction. The characters in the story are fictional. The person in the photograph and the story are not related in any way! Also linking this post to the Weekly Prompt: Who Am I?